From the Heart, Mrs. Grossman's Stickers! 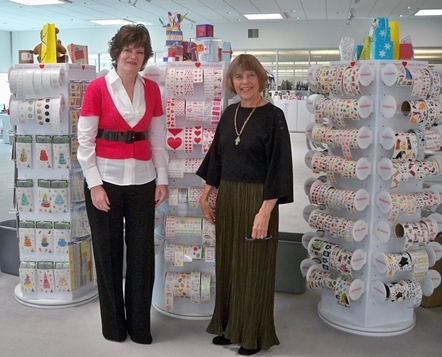 In November I had the wonderful opportunity to visit Mrs. Grossman's Sticker Company and Paragon Label in picturesque Petaluma, California. The company is featured in my latest "Make it Green' column for Creative Homearts magazine. I met both Andrea Grossman the founder and her son Jason, President. They could not have been more welcoming. In fact the moment you enter the building for a tour you are greeted by friendly employees and their dogs, life sized fun sticker characters on display and an atmosphere that is very special and inspiring. When I asked Andrea for a quote for my article she replied as she has for more than thirty years and her favorite quote will always be ?? ?I love my job.??? I will be showing projects made with their gorgeous classy silhouette stickers later this week. The stickers were released at the CHA show in January. The company that began with a single red heart sticker continues its tradition of always operating from the heart with care for the environment, its employees and its loyal customers. If you are in the area of the company make sure to go for a tour. 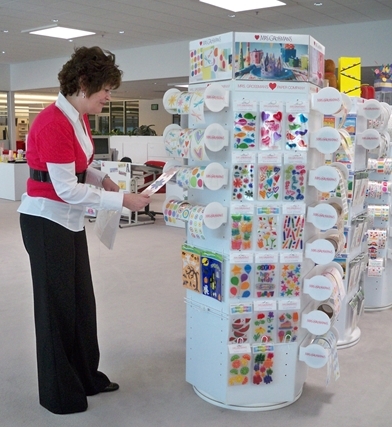 They are the only sticker company in the country that offers a tour of their manufacturing facility plus they have a sticker museum and shop on site. With Andrea Grossman & the Heart Sticker that began it all! Decisions, decisions! Choosing stickers to design with. 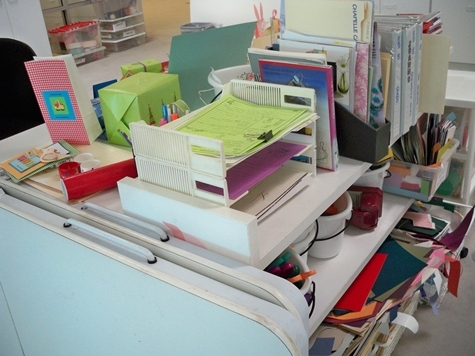 Part of the busy design center at Mrs. Grossman's!